There is a red color on all edges of the pages, more of which is explained on the Printing and Creation page. 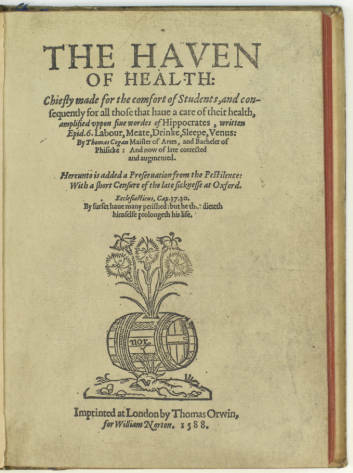 From this statement, it would then seem that, though The Haven of Health was written for students, it may have been commissioned by the Earl of Hertford for the general public, especially after The Black Assize in Oxford in 1577. Or if it was not commissioned, Cogan depended on the Earl of Hertford as Patron to allow his book of health to reach all of England. 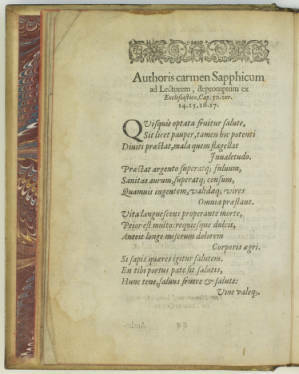 Following the Epistle to Sir Edward Seymour, there is found one page of Latin, which could be translated by someone who knows how to translate it; unfortunately, we did not have the appropriate skills. The last thing found before the 276 pages of Cogan's The Haven of Health is a six page epistle to the reader. 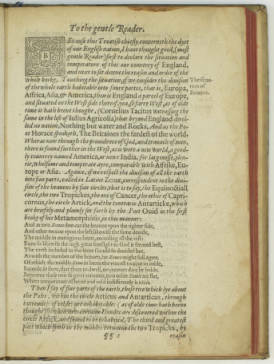 Within this epistle, Cogan describes the four divisions of the habitable earth, meaning the four major continents at the time ("Europa, Affrica, Asia & America"). He delves into geography, and in basic terms, lays out to his English students why England is the most temperate country. He then implores his readers to take his haven of health seriously, and that "euerie man will interprete all to the best," or interpret each piece of advice in the way that will be best for him. These are the last words before Cogan begins The Haven of Health. Thomas Cogan. 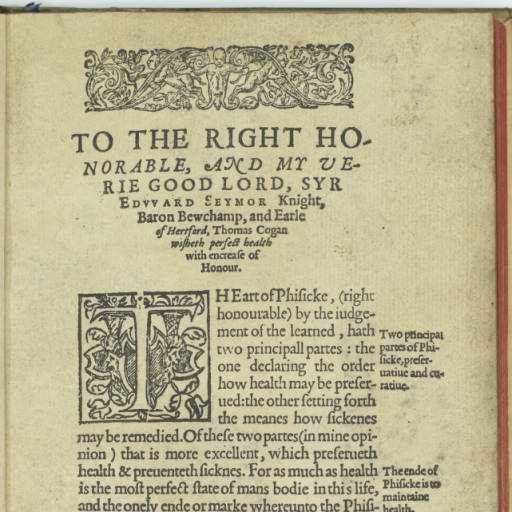 The Haven of Health: chiefly made for the comfort of students, and consequently for all those that haue a care of their health, amplified vppon fiue wordes of Hippocrates, written Epid. 6. Labour, meate, drinke, sleepe, Venus: by Thomas Cogan maister of Artes, & Bacheler of Phisicke. 1588, Dedicatorie epistle 1. Edward Seymour, 1st Earl of Somerset was the Lord Protectorate of King Edward VI, son of Henry VIII, from 1547-1549. Cogan, The Haven of Health, Dedicatorie epistle 7. Ibid., To the gentle reader 1. Ibid., To the gentle reader 6.